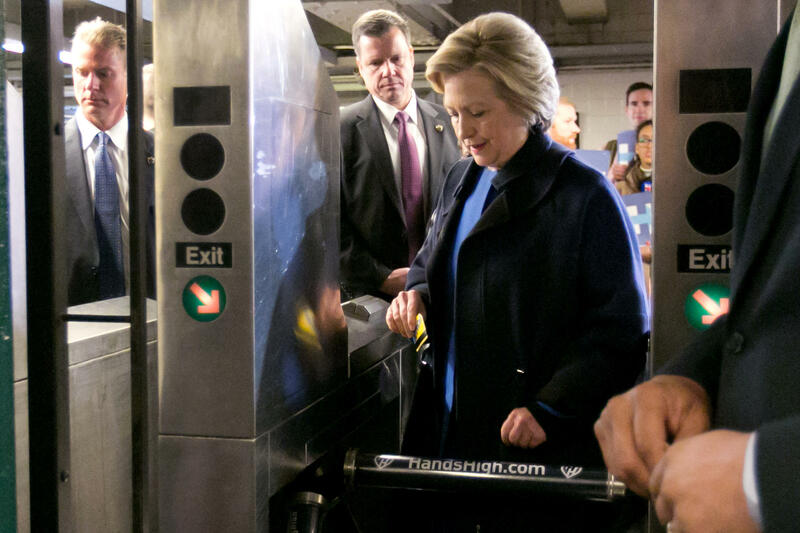 Democratic presidential candidate Hillary Clinton holds her MetroCard as she goes through the turnstile to enter the subway in the Bronx on Thursday. The things they do for love. Politicians will eat almost any food, adopt any colloquialism, endure any level of awkward — just to seem "authentic." The latest example? Democratic presidential candidate Hillary Clinton, riding the New York subway through the Bronx, saying hi to babies and taking selfies along the way. Depending on your point of view, the event — and it was an event — could be viewed as either a shining testament to Clinton's New York bona fides, or just the latest example of how out of touch she is. Clinton came to the train with Bronx Borough President Ruben Diaz Jr. and an extensive security detail. From the start, things didn't go as planned. It took Clinton five swipes just to get through the turnstile (three more swipes than stops in Clinton's actual ride). On the train, Clinton tried to engage a young woman with headphones on. That woman was not impressed. Once she got off in the Bronx, things went a little better for Clinton. She spoke with locals, stopped by a small shop and even smiled for a few babies in strollers. For all the awkward moments, the candidate did seem to have some fun, and she was met by supporters all along the way, some even chanting their support for her. But, there was criticism. Clinton hasn't driven since the '90s, and it's fair to assume she's not a regular subway rider. (Her New York home is north of the city in posh suburb Chappaqua.) Some questioned just how long it's been since she'd actually been on a train. There was even a debate online about whether Clinton's subway ride, which some viewed as a campaign event, was legal. -She should have been on a car with subway dancers, working for tips. "What time is it? SHOWTIME!" -She should have made a stop at a local bodega. -Once there, she should have brought some lottery tickets. -She also should have petted the bodega cat. You know there would have been a bodega cat. -She shouldn't have tried to talk to anyone on the train. 'Cause, yeah, just don't do that. -Someone should have offered her a mixtape, or some essential oils. -She should have seen a couple get into a tear-filled argument at some point in her ride. -She should have had to wait — a long time — for her train. Clinton, in her struggle for authenticity, is not alone. Ted Cruz made matzo, awkwardly, with children for Passover this week. Every politician, just about everywhere, eats more fried food than they should, just to be an everyman (or woman). There is a larger question in all of this: Why are politicians so concerned with proving their authenticity? Or, better yet, why do they think we care so much about it? And that raises yet another one: Do we? For what it's worth, Bernie Sanders seemed to one-up Clinton by the end of the week. He appeared on ABC's The View, where the hosts gave him his very own subway card. And he ate a piece of New York pizza properly: folded, no fork or knife.